“We are not here only to pay tribute to a dear friend, but also to raise the question: Why was Ramy killed? 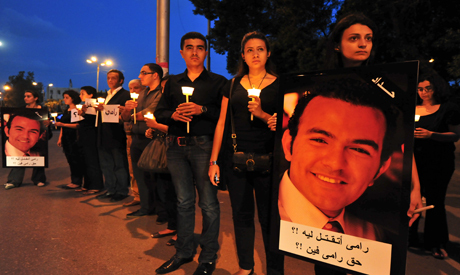 We demand a full-fledged investigation” said Marc Wassim a close friend of Ramy’s. Ramy Fakhry, 27-year-old electrical engineer, was killed by the army, but there are many versions on the details fluttering around on the internet, although nothing could be confirmed since he was driving alone. Fakhry was taken to Salaheyya General Hospital after he was shot. The coroner’s report indicates he was shot three times from behind; in his neck, chest and back. “This death is mysterious; we need to know why and how he was shot,” asserts Hany Wahba, one of Fakhry’s close friends. It is believed that drug dealers frequent the area. The most common story that people give for the events that transcribed is that Fakhry came across a shootout between military forces and drug traffickers. As he tried to make a detour to flee for his life he was mistaken for an assailant and was shot. One version says he left the rig where he worked near Damietta on Friday 13 May to attend Marc’s brother’s wedding. On his way back later that night at 1am - before the curfew - Ramy Fakhry was shot dead at an army checkpoint. The silent candlelight vigil held for Ramy Fakhry didn’t come with any religious restrictions as Christians, as well Muslims, were wholeheartedly welcomed. “This is not a Christian tribute, but rather an Egyptian one,” said Christine Elias, one of Ramy’s friends and one of the event organisers. “Ramy was such a lovable guy. He was loved by all his friends: Christians and Muslims. We all will greatly miss him” she added before bursting into tears. Ramy Fakhry's family refused to attend the silent vigil in tribute to him that was organised by friends and activists on Facebook. The family agrees that yesterday’s memorial in the church was enough to receive people’s condolences. “I don’t see any reason for this stand. I want to report against it, but am really tired and couldn’t leave my home,” says Nagy Samaan, a representative of the family." Samaan says they have no suspicions and that all legal procedures were proper. “I have no problems with how it was handled,” Samaan told Ahram Online. Two army soldiers are being held by the military for investigation. Fakhry, a man much loved by his friends and family, left many people in deep sorrow. Facebook groups were dedicated to the incident and his killing was the subject of many tweets by Egyptians on Twitter. “The smile never departed his face,” said Nevine Nasr, one of Fakhry’s close friends. Monday was the third day of prayers for Fakhry at St Mark's Church in Heliopolis. Fakhry attended the church regularly and even participated in the service there. “He had nothing in life but work and church; he was a very kind person,” said Mona Fanous, church service head at St Mark’s Church Heliopolis. very well Done Mohamed.. I'm sure all these efforts will be fruitful in the near future..